It might be hard to tell from the picture, but they are currently walking on the bridge (and not in the water itself) before the bridge is even built. 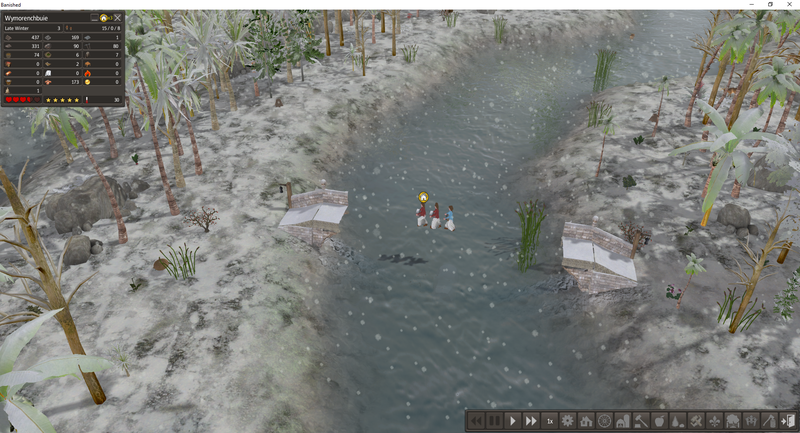 When they were dropping off the resources for the bridge, however, they were actually walking through the water to the other side. They were thankfully able to walk back over, but it was certainly just odd. According to the CC storage spreadsheet, the large dock storage shouldn't be storing firewood, but it does. Is there a reason to have 2 fig seeds at a trader? I just saw this option at the large trade port and thought you might like to know. Thanks for reporting this issue. If you look at the very first post in this thread, it lists previously reported issues and their status. Apparently the duplicate Figs have been reported and fixed for the next release. If you look at the very first post in this thread, it lists previously reported issues and their status. Apparently the duplicate Figs have been reported and fixed for the next release. We're on page 2 now, and apparently I have a short memory, lol. Thanks! @datette It's much better to report something that's already been reported than to not report it at all. We really appreciate you taking the time to do so! The small dock storage barn takes firewood too. Is it weird that a Fibers and Fabrics trader sells booze? Is also weird that they'e selling trade animals. Are you using any other mods? Would like to follow up with my bridge glitch and say that I also found the same thing to happen with the old creek bridge. So, I guess it is happening to multiple, if not all, bridges. This is everything. Not a lot. I think the culprit is the 1.0.7 Compatibility mod. it isn't needed for MM8, because MM8 was made with the 1.0.7 modkit. It was MM7 that needed it, because it was using the 1.0.6 modkit. And the compatibility mod does some weird things to the Trading Post to allow the new resources to come at the Trading Post at all. I'm not sure what's supposed to be in this toolbar here, but something's missing. See red circle. Anybody else with this issue? did you tried to alt tab during that time and go surf ? when the game it is not focused, the game skip all the error detection the developer included and it load faster. well I alt tabbed after it took several minutes to load already, that cannot be the issue. This mod is quite large and it has to read a lot of stuff from the hard drive into memory. If your hard drive is slow and if you don't have a good amount of memory it can take a long time. What you can do is to just enable the 3 mods from megamod and see if it helps. I remember to have a similar issue and I had solve it by starting the game enable and disable the mods that I want and then going back to main menu and exit the game. Then start the game again and you can create a new game now using the previous defines mods. MegaMod is huge and can take 10-15 minutes to load! A lot depends upon your computer. Make sure you aren't running any other mods (or just a few small ones). For example, you don't need CC 1.75 - it's included. You also don't need the compatibility mod. Sometimes it helps to move old saves out of your Save folder so those don't have to be loaded. Can also help to move mods you aren't using out of your Banished > Windata file. Some people find that using DX11 instead of DX9 makes it faster to load (for me it reduced the time from over 5 minutes to under 2); others find it the opposite or that it causes crashes. Note that anytime you add or delete mods, you should exit the game completely before using them - helps to prevent crashes.